If you want to stream music from a wireless device or make hands-free phone calls in your car, a Bluetooth car kit is what you need. To help you identify the perfect product, our team performed extensive research on Bluetooth car kits. We looked at the best models for listening to music and taking phone calls, considering factors like type of connection and sound quality, among others. Learn more about Bluetooth from our handy buying guide below. 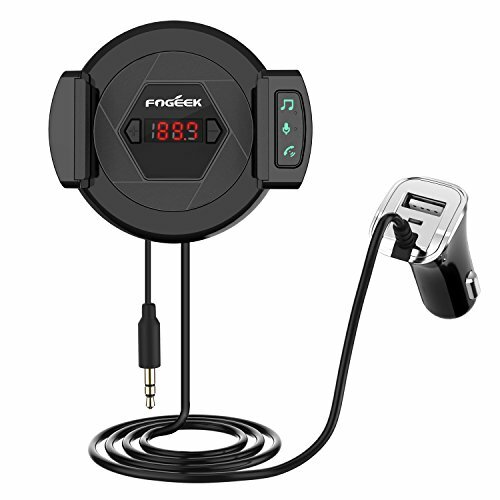 The FOGEEK Bluetooth FM Transmitter has everything you need in a convenient 3-in-1 design—a Bluetooth FM transmitter with 3.5mm audio cable, universal phone holder, and USB charger. This kit gives you the flexibility to connect by either FM transmitter or an aux port. You can save a few bucks and still get all the benefits of Bluetooth in your car with the TEQStone Bluetooth Car Kit. Aux and FM Transmitter options, a 2-port USB charger, and a great price are the highlights of this kit. Supporting noise cancelling and 4 different music sources, the Tomight Bluetooth FM Transmitter excels as a music-playing Bluetooth car kit—a great price adds to its overall value. 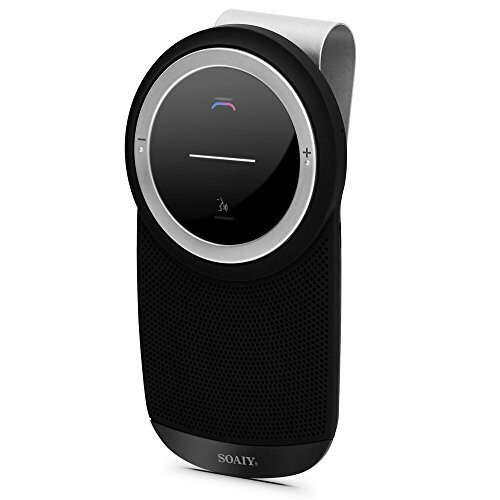 The SOAIY S-61 Bluetooth Car Speakerphone brings you the best in hands-free phone calls. With an incredibly strong Bluetooth connection and easy pairing to your phone, you’ll be using the SOAIY S-61 every time you get in your car. The iClever Portable Bluetooth Adapter comes with two-link share to connect multiple devices simultaneously, TX and RX modes, and aptX technology for increased sound quality. The iClever can be used in many different ways with its advanced features. The first thing to determine is how you will connect the Bluetooth car kit to your stereo system. Many older car stereos do not have an auxiliary input jack, let alone built-in Bluetooth capabilities. Therefore, most Bluetooth car kits work as FM transmitters that link via your radio. You simply locate an empty frequency on your car radio, then set the same frequency on the Bluetooth car kit’s FM transmitter—finish by pairing your phone to the device through Bluetooth. 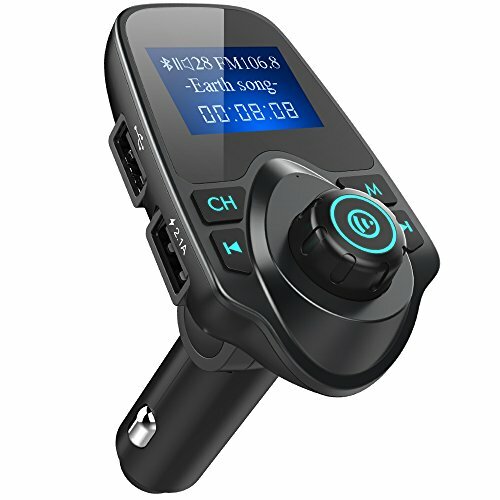 If you have an aux port in your car, you can purchase a Bluetooth car kit that connects directly for a little better sound quality. There are even car kits that are free of all wires. Of course, listening to music and making calls through your Bluetooth car kit won’t be worth much if you can’t hear and be heard well. Better Bluetooth car kits typically have better sound quality, with included features like noise-cancelling, echo-cancelling, and low latency. You can also take some steps on your own to control sound quality through kit placement and finding the best radio frequency. With the right combination of kit equipment and arrangement, you can elevate a tired sound system to new heights. Some Bluetooth car kits can be connected to multiple devices at once, and most include additional USB ports to charge your phone while in use. There are also car kits that allow you to choose between aux and FM transmitter connections. Other features to look out for include accepting multiple music sources, hands-free calling, wireless operation, and LCD display. These advanced features add value and can make the difference depending on your priorities. Bluetooth car kits range from $10 to $40, making them a sensible solution to upgrade an older car. What’s more, you won’t have to sacrifice quality because many Bluetooth car kits produce excellent results. As you spend towards the upper range, you can expect greater connectivity and advanced features such as noise-cancelling technology. However, spending less doesn’t mean you have to get less, as most modern Bluetooth car kits enjoy similar advantages. At any price, a quality Bluetooth car kit will reliably connect to your phone, clearly play your music, and allow for safe, hands-free phone calls. With a slick style and rare flexibility, the FOGEEK Bluetooth FM Transmitter is an all-around outstanding Bluetooth car kit. The kit’s transmitter, USB charger, and phone mount are woven together in one seamless design. While you can connect to Bluetooth through the transmitter, you also have a 3.5mm audio cable on the kit for directly plugging into an aux jack. Even more impressive is the ability to pair and use two devices simultaneously for multitasking. Impressive 3-in-1 design. 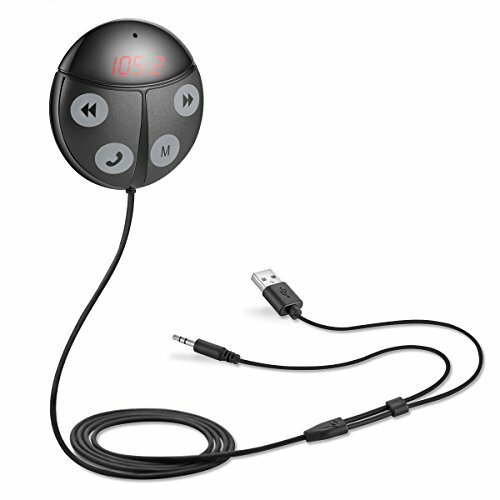 Every important feature is closely contained on the FOGEEK Bluetooth FM Transmitter. The USB charger will keep your phone charged while it sits snugly on the air vent rubber-padded phone mount. Enjoy music and hands-free calls with technology that reduces sound distortion. 3.5mm audio cable included. If your car has an aux input jack, you can plug in the FOGEEK transmitter via the attached audio cable. This gives you an another choice in how you connect your device—using the audio cable may increase sound quality. Connect two devices simultaneously. Use your phone to place a call without disrupting other media by connecting two Bluetooth-enabled devices at the same time. You won’t miss a call, and you’ll have the flexibility to listen to music or display a map on another device. Short audio cable length. The 3.5mm audio cable is a little short, so it can be hard to reach the jack on certain cars. You can purchase an extension cord separately if needed. Charger works for most, but not all phones. While you shouldn’t have a problem charging your phone, there is one notable exception. The iPhone 7 Plus will not charge on the included USB charger. The TEQStone Bluetooth Car Kit performs admirably while beating out other brands at this price. 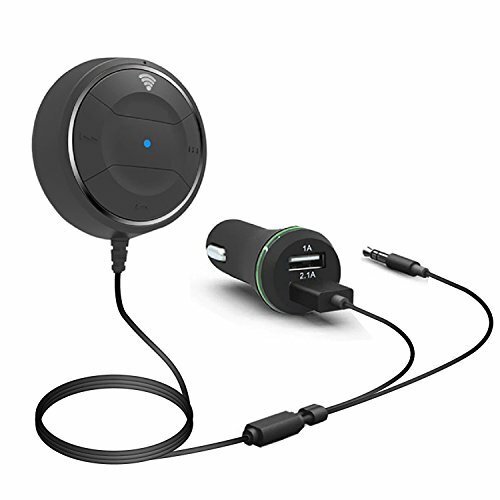 It comes with several features you don’t expect to find at a budget price, including a hidden FM transmitter, an LCD display, and a 2-port charger. The simple interface feeds you the information you want and gives you the control you need for different tasks. The velcro stickers allow you to place the kit anywhere, and the easy setup gets you started right away. Outperforms other budget kits. The TEQStone gives you a lot for a little, and we found the sound quality both on calls and while listening to music to be praiseworthy. The included 2-port USB charger is great for charging one device while using another. Hidden FM Transmitter. While the TEQStone car kit directly plugs into an aux input jack, it also has a hidden FM transmitter that works well. It’s a nice surprise that opens up access to more users. Streamlined interface. The music controls are easy to use, and the clear LCD screen can display names and numbers as calls come in. The streamlined interface means no wasted space, and there’s only one cord to worry about. For added comfort, place the kit wherever you want with the velcro stickers. Round shape. While you can likely place the velcro sticker anywhere in your car, the TEQStone’s rounded form can be difficult to set onto very flat surfaces. No noise cancellation. Even though this product does not have noise-cancelling technology, we did find the sound and call quality to be good. Plugging directly into the aux port will give you the best results. Pairing a Bluetooth car kit with a Bluetooth-enabled phone or device can be the best way to listen to your music while you drive. Whether you have an older car or don’t want to replace your entire stereo system, purchasing a Bluetooth car kit for music is a great alternative. The best kits in this class will have crisp sound and broad compatibility to play music from different sources. When it comes to playing your music collection through Bluetooth, you’ll want as little interference as possible to achieve a crisp sound. The Tomight Bluetooth FM Transmitter eliminates static and other distractions with its noise-cancelling technology, making it a great pick for music lovers. You can bring your music to the Tomight from 4 different sources, including Bluetooth, micro SD card, USB flash drive, and 3.5mm audio cable. The large screen displays your songs, calls, and other messages, and the USB ports charge your devices. Accepts many music sources. Load up all your music on a micro SD card or USB flash drive and plug it right into the Tomight transmitter, or just use Bluetooth. With 4 music sources supported, you’ll have no problem getting your music library to your car speakers. Noise-cancelling. With its advanced technology, the Tomight car kit stamps out the interference that tends to afflict FM transmitters. Once you find a blank FM station, the Tomight transmitter will do the rest of the work to ensure crystal clear sound. Informative lit display. The large, bright display on the Tomight transmitter clearly communicates calls and songs. Interestingly, it can even exhibit your car’s current battery. Great value. Competing brands usually can’t squeeze extra features like noise-cancelling into a product priced this low, and you also get a good microphone for hands-free calls—the Tomight represents considerable value. Tight fit in cigarette lighter socket. The cigarette lighter adapter can be tough to get into and out of the socket. If you can, you may want to leave it in the socket once it’s in place. The VICTONY Bluetooth Car Kit turns on as soon as you turn your car on, like it’s as eager to start playing your music as you are to listen. Built to plug directly into an aux input jack, the VICTONY Bluetooth Car Kit will cut out unwanted noise so you can enjoy musical clarity—you’ll also enjoy practical extras like a magnetic base, NFC connection for quick pairing, and auto-connecting to the last paired device. Excellent sound quality. The echo and noise-cancelling work together to produce clean sounds. Tailored to aux connections, the VICTONY car kit further promotes the listening experience you desire. Audio extension cord included. The included 3.5mm extension cord will reach your car’s aux jack no matter how far the kit is placed. Easy to use. NFC technology makes for quick pairing between your phone and the Bluetooth car kit, and the kit will automatically reconnect to the last paired device. There are button shortcuts built into the kit, and its compact construction allows it to fit anywhere. Magnetic base. 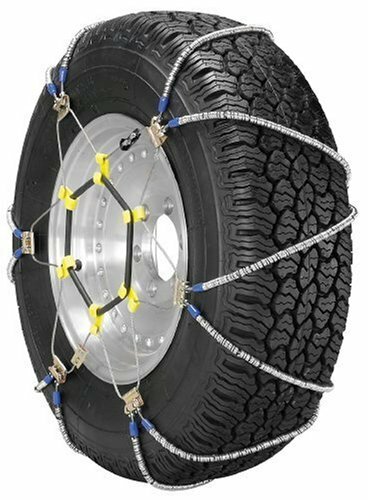 Unlike the typical velcro base, the VICTONY’s unique magnetic base is easy to install and dismantle. It’s simple to adjust the position of your car kit. Infrequent reconnecting required. Some users reported occasional disconnects between the VICTONY and their phones—it could take about a minute to establish the connection in the rare case this occurs. If you don’t have Bluetooth built-in to your vehicle, a Bluetooth car kit can help ensure that you make and take calls safely while traveling. Your primary concerns should be hands-free calling and how well you can hear and be heard. Also, many of these kits clip onto your sun visor for convenience. 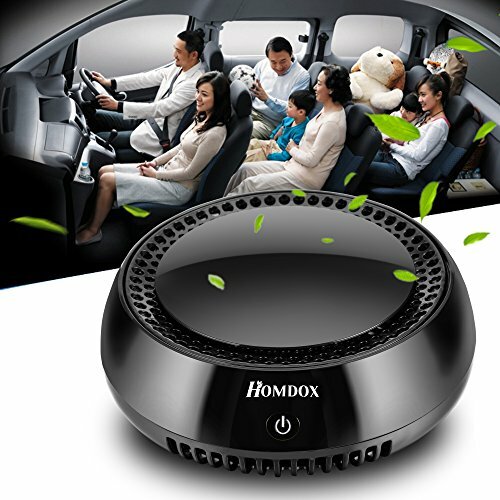 Whether you are contacting a friend or need to take a professional business call, a Bluetooth car kit can keep you connected while promoting safe operation. Hands-free phone calls are the staple of a good Bluetooth car kit. In addition to solid noise cancelling and a strong connection, the SOAIY S-61 Bluetooth Car Speakerphone easily clips to your sun visor, features power-saving technology, and can connect 2 devices simultaneously. There’s no clutter to worry about, as the SOAIY S-61 is entirely wireless when it’s not charging. Clearly, the SOAIY S-61 packs a lot of goodies into one simple-looking Bluetooth speakerphone. Strong Bluetooth connection and range. If you are making phone calls through Bluetooth, a strong connection is paramount. You can’t afford to drop a connection or have muddled sound during important calls. Fortunately, the SOAIY S-61 is stable, loud, and has a long range so that every call is satisfactory. Power-saving features. The creators designed the SOAIY S-61 so that it uses power efficiently. It will auto-connect and can automatically power on and off. To bring it back from standby mode, just shake something nearby. Voice commands. Hands-free voice activation means you can shout “yes” to accept a call or “no” to reject one. Send texts through voice or activate your GPS—you’ll be kept safe while obeying the law with the hands-free operation. Be mindful of the range. If you do not manually turn things off, you can accidentally connect your phone to the S-61 after leaving your car because of the long range. No option for wired connection. You cannot use this kit to plug directly into a source, as it only works wirelessly. Most Bluetooth car kits can only be paired to one device at a time. Bluetooth Car Kits that can simultaneously sync to multiple devices add more utility. For example, you can be chatting on the phone through one device while listening to music on another. Or, you and a passenger can both be connected to the Bluetooth kit. The best kits for multiple devices also have advanced features that increase connectivity. Despite being the smallest Bluetooth kit of our selections, the iClever Portable Bluetooth Adapter is arguably the most feature-rich. It can fit in the palm of your hand with ease, but we can barely fit everything it can do. 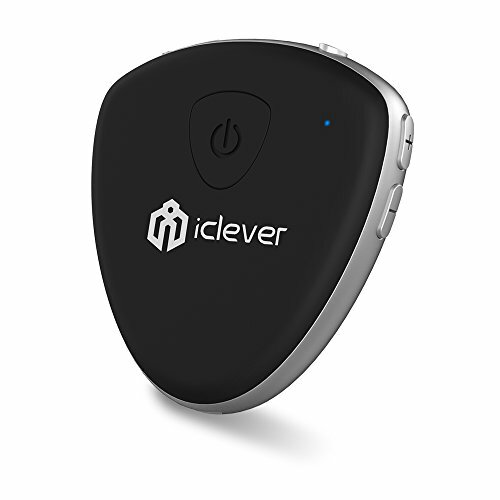 The focal points of the iClever include two-link share for connecting multiple devices simultaneously, crystal-clear sound through aptX low latency, and dual TX and RX modes so it can act as a transmitter and a receiver. You can bring this adapter everywhere, as it has practical uses even outside the car. Simultaneously use two devices over Bluetooth. Two-link share achieves seamless Bluetooth connection for two devices. Use your phone and mp3 player at the same time, or have a friend connect their phone to the iClever. Vast connection options. You can connect two devices to the iClever, connect it directly to an aux jack, use it entirely hands-free for calls, or use it in other ways. The iClever adapter can act as as a dual transmitter and receiver so you can stream media between any devices you have, even those without Bluetooth. In dual transmitter and receiver mode, the possibilities are endless. AptX technology. This feature brings CD-quality sound over Bluetooth connections. AptX low latency reduces unwanted noise and can synchronize video with wireless audio. Pairing. Pairing is not as instant as with some other Bluetooth kits, but is still a speedy process. Small design with small buttons. The small design has plenty of advantages, but it does mean that buttons require a little more of your attention to press.